LOUISVILLE – In the aftermath of catastrophic flooding in the Gulf region, Presbyterian Disaster Assistance is providing assistance to the Presbytery of South Louisiana and reached out to the Presbytery of Mississippi. PDA has approved two grants to be used to address community needs. 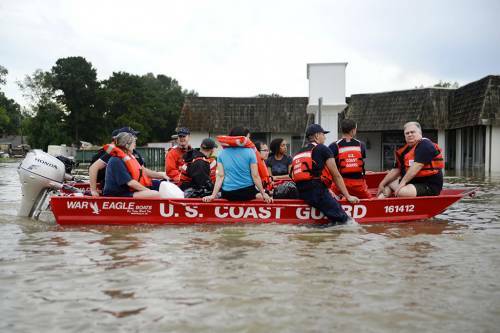 The flooding last weekend dumped nearly 22 inches of rain in parts of Louisiana and other Gulf states according to the National Weather Service. Some communities reported as much as 31 inches of rainfall. The Federal Emergency Management Agency (FEMA) reports as many as 7,000 people were staying in one of 37 shelters across the region. The latest death toll is reported at 13 and state authorities are still searching homes and businesses. The American Red Cross and other agencies say it is the worst natural disaster to strike the United States since Superstorm Sandy and some say the damage is more widespread than Hurricane Katrina. The office of the Presbytery of South Louisiana was among the thousands of buildings damaged by flooding. Tom Tucker, the presbytery’s treasurer and assistant stated clerk says the water receded by Tuesday morning, allowing him to get to the office. Tucker said the force of the water in the parking lot moved the concrete parking blocks like “pick up sticks.” Meantime, remediation crews have come in to pull up carpet, remove drywall and begin the process of drying out. A couple of churches have offered classrooms as a temporary office for the presbytery. Tucker and the staff are trying to secure internet service now. The damage was worse for the Faith Presbyterian Church, located next door to the presbytery. Tucker said the congregation has been invited to worship this Sunday with Highland Presbyterian Church. Tucker also spent some time visiting with those being treated for diabetes and other illnesses at nearby medical shelters. University Presbyterian Church, which did not sustain damage in the flooding, has opened its doors as a shelter for women who have just given birth. She says they are currently hosting three families with newborns but could extend that to housing for volunteer workers in days and weeks to come. Snyder has been helping some of her members return to their homes once the floodwaters receded. She described neighborhood curbs piled with damaged furniture, carpet and other items. Snyder was taking Cindy Burris to her home in Denham Springs. Burris was within a few months of paying off a 30-year mortgage on her house. The Presbytery of South Louisiana has been contacted by FEMA to use their retreat facility for volunteer training and housing. There are also plans to begin a flood recovery ministry at the facility. Kraus says churches in Baton Rouge and neighboring presbyteries like New Covenant have been quick to offer assistance, housing for volunteers and other resources. Financial support allows PDA to respond to disasters as they unfold and continue the recovery long after many organizations have left. If you are interested in giving to help those suffering in Baton Rouge and the Gulf Coast, you can link here. For more information about PDA response to the flooding, click here.